After discussion among the US Army Corps of Engineers, GLSPS, MHS SHPO, DNR, City of Duluth, USCG and others, the Corps of Engineers and GLSPS are going to put a large artifact back in the cold waters of Lake Superior to once again help preserve an artifact. We first tried to find a place to display the rudder on land for public view, but it was very large and would cost a lot to preserve it now and in the future. The GLSPS has a program called the Put-It-Back (PIB) program to help preserve large artifacts such as the Mataafa Rudder by placing it back on the underwater near the shipwreck site to preserve it. 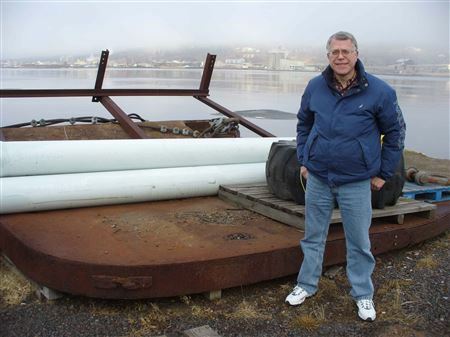 The rudder will be placed in its final resting place Wednesday, September 24, 2014 at approximately 1:00 PM near the red can buoy by the old Outer Harbor Breakwater, off shore from the Canal Park Lake walk in Duluth. It will represent the shipwreck of the Mataafa that took place near the Duluth Ship Canal back in November 1905 during the Historical and famous "1905 Storm." The Mataafa was raised and repaired after the sinking and continued to sail on the Great Lakes. In 1914, another storm occurred which caused the ship to veer off course near the Superior Entry and strike the breakwater. The rudder fell off, but was replaced by another one. The US Army Corps of Engineers recovered the lost rudder during dredging operation 15 years ago. It was stored on their dock afterwards. 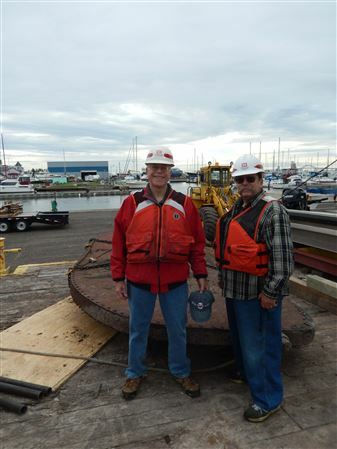 The rudder will be placed in its final resting place Wednesday, September 24, 2014 at approximately 1:00 PM near the red can buoy by the old Outer Harbor Breakwater, off shore from the Canal Park Lake walk in Duluth. The U.S. Army Corps of Engineers Barge will use their Crane to drop the Artifact in the water. It will represent the shipwreck of the Mataafa that took place near the Duluth Ship Canal back in November 1905 during the Historical and famous "1905 Storm." 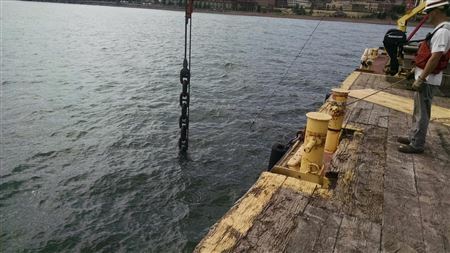 At 1:00 PM it will be loaded onto the U.S. Army Corps of Engineers Barge and floated out to its special marked area and placed in the waters of Lake Superior again. If you are interested in reading more about this historical Ship and how it suffered its fate, please click on this link. 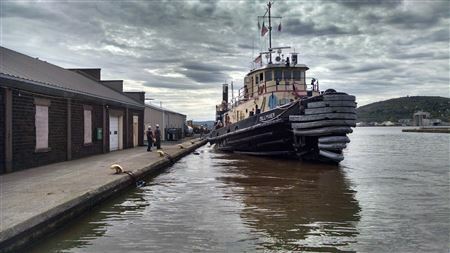 The GLSPS is grateful to Denise Wolvine, director of the Lake Superior Maritime Visitor Center in Canal Park in Duluth for her help in expediting the approval and permit process that need to be completed before the rudder could be returned to the water. In addition, the GLSPS thanks all the government agencies, including the City of Duluth, for their help in providing a quick turnaround on their approval. This allowed us to meet a tight schedule for the US Army Corps of Engineers vessel and equipment that were necessary to do the job. We also appreciated the excellent work of the Captain and crew of the USACE H.J. Swartz and its accompanying tug, the Bill Maer, for their expertise in placing the Mataafa Rudder back in Lake Superior. The project went well, with the rudder being lowered in a flat horizontal position, so that it would rest flat on the bottom. Thom Holden, USACE (retired), who previously director of the Lake Superior Maritime Visitor Center, was on board to record the event. Watch the Nor'Easter newsletter for the LSMMA for a story by Thom about this event. The rudder is on an imaginary line exactly between the lighthouse on the Duluth Ship Canal Entry (north pier and the buoy marking the Old Harbor Breakwater cribs. It is out from the corner of the Lakewalk, sighting on the red brick restroom on shore. The distance from the red buoy is about 100 yards. It lies in about 30 feet of water. If you are interested in learning more about this event, please contact Steve Daniel, the PIB Chairman. His contact information can be obtained by clicking on the "Contact Us" button on the left side of the GLSPS Website. Thank you to all who made this possible. Especially to Denise from the U.S. Army Corps of Engineers and their Crew aboard their special work barge. The Mataafa Rudder was loaded on the USACE HJ Swartz Crane Barge Wednesday morning. Denise Wolvine, director of the Lake Superior Maritime Visitor Center, was instrumental in obtaining approvals from several government agencies, along with a permit to place the large artifact in Lake Superior. Arrangements were made to begin the return process at 1:00 PM Wednesday. Steve Daniel, representing the GLSPS, and Thom Holden, retired LSMVC director, were on board to record the event. 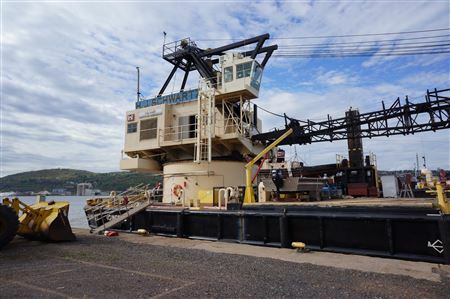 The tug USACE Bill Maer was positioned alongside the huge barge and secured in place. After a quick trip through the Duluth Lift Bridge to the PIB site, the crane barge was maneuvered by the tug, using the spuds to hold it in place. 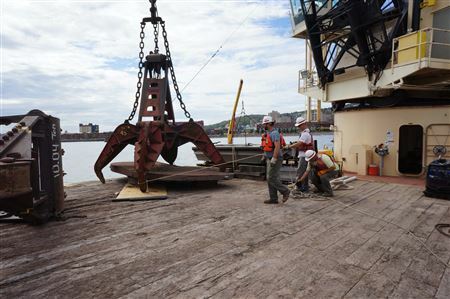 A big grappling tool was lifted by the crane operator and gently placed around the rudder. The claws were slowly closed around the edges and the rudder was lifted over the starboard side of the barge. It was slowly lowered in a prone position until it rested on the bottom. The claws were released, leaving the rudder flat on the bottom of the Lake. The equipment was returned on board, the spuds raised and the tug and crane barge proceeded back through the ship canal to the Corps of Engineers dock. Highlights were watching the Lift Bridge raise full height, being followed in by UMD's research vessel Blue Heron, followed later by the Anderson bulk freighter. The GLSPS sincerely appreciates the generous help of all the US Army Corps of Engineers people and many others in various government and historical groups who helped make this project possible. 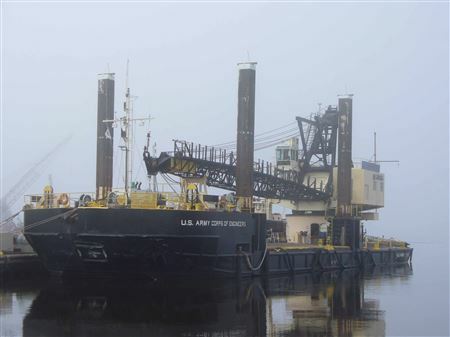 US ACE Bill Maer Tug towed the crane barge to the site. and placed it in Lake Superior at the designated site. on board the USACE HJ Shwartz. The crane lowered the rudder until it was flat on the bottom. The Mataafa Rudder lies on an imaginary line between the north pier lighthouse and the red can buoy, directly out from the red brick restroom on shore in the corner by the Lakewalk in Canal Park.